Travel back to the days of trading vessels braving the high seas—with a luxury spin. 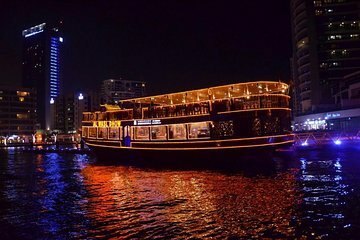 On this VIP dinner cruise, you’ll hop aboard a traditional wooden Dhow boat for a high-end buffet as you glide by the glittering Dubai Marina. Relax in an air-conditioned lower level, or enjoy the open air up on the deck. Tours include live entertainment, unlimited soft drinks, and transfers from your hotel.